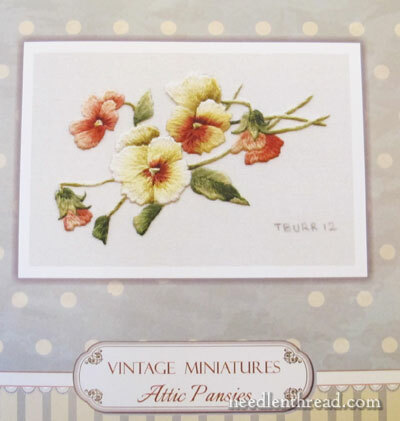 Needlework Environments & Trish Burr Kit Winners! 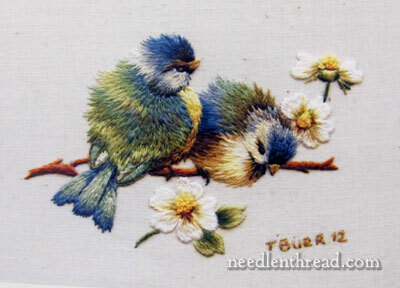 It looks like lots and lots of us love the new Trish Burr miniature embroidery kits! The response to last week’s give-away was really wonderful – thank you so much for participating! I really enjoyed reading all your answers as they came in. The responses to the “embroidery environment” question illustrate quite well how different we are, but at the same time, how similar – we all love to stitch, no matter our environment! Like many of you, my background environment when I’m embroidering depends on what I’m doing with my embroidery. My favorite place to stitch is not very “romantic,” I’m afraid! I love your descriptions of stitching in front of the fireplace, or in the sunroom, or on the lake, surrounded by friends, surrounded by family, on the porch with the twittering birds, with your pets …. *sigh*…. it all sounds so lovely! I’m afraid for me, it’s my very utilitarian workroom that I prefer, because I can generally stitch there with very little distraction. I don’t even have a phone out there! If I’m trying to work something out that takes concentration, I prefer silence or very quiet music, turned down low. I’m more of a classical music and folk music kind of person. This time of year, though – it’s Christmas music! I am a Christmas music nut. I love Christmas “classics” (Nat King Cole, Bing Crosby, Perry Como, even Mitch Miller – bring ’em all on! ), Christmas choral music (Cambridge Singers are my favorite), orchestral Christmas stuff (ASMF, Boston Pops…), and Christmas instrumental music (for example, Judith Lynn Stillman and the like). But… my Absolute Favorite All-Around Background when I’m not in concentration mode is a really good audio book. Give me a well-read audio book and some embroidery, and a quiet spot, and I’m perfectly content. Classics are game – from full-cast Shakespeare productions, to unabridged Dickens to Jane Austen to the Brontes, Elizabeth Gaskell, Evelyn Waugh. I like PG Wodehouse, I love Peter Mayle’s books, Willa Cather – the list could go on and on. And I’m a sucker for good mystery writers – Agatha Christie, Ngaio Marsh, Dorothy Sayers, Arthur Upfield, Gladys Mitchell. Yep. I should own stock in Audible. But enough about me – let’s talk about you! Time to get on to the winners! Cynthia Green: I like having the TV on in the background, but only if it is reruns. If it’s something that I need to pay attention to, it’s too hard to stitch at the same time. The second alternative is music. Audio books are cumbersome because I have to stop them frequently when I need to read directions or have to really concentrate on what I’m doing. Cris Tilliss: My absolute favorite place to stitch is with a group of friends, where we can all work on a piece and laugh and giggle at the same time. I always find it stimulating to receive the comments from those around me and vice versa. Otherwise, I prefer to stitch at home in my sewing room with a little ambient music or TV. The companionship from other stitchers is like none other, and there is always such a bond that forms over the years. Congrats to both of you! Please contact me with your mailing address and I’ll get these off to you. If you didn’t win and you’d like one of the kits, keep an eye on Trish’s Etsy shop after the new year. She’s closed down now for the holidays, but she’ll return in January. Upcoming Give-Aways You Won’t Want to Miss! Normally, I don’t “officially” announce give-aways ahead of time, but there are a few coming up here on Needle ‘n Thread in the next several weeks that you won’t want to miss. There’s one more before Christmas – some great little needlework project / tool bags – and then after Christmas, a whole complete line of an embroidery thread that I love (one of every color!). And then? Well, I’ve got a few more of Trish’s kits up my sleeve for you. Congrats Cris and Cynthia – very envious here! 🙂 YAY for audio books Mary – couldn’t agree more! Congrats to Cynthia and Cris I hope you both enjoy the lovely kits. Oh Mary a Gal after my own heart I love listening to audio when stitching and especially Agatha Christie or Jane Austen or the Brontes, Elizabeth Gaskell and sssssssoooooooo oooooooooooonnnnnnnnnnn my favourites though are Poirot and Miss Maple which if on TV I watch avidly. Can’t wait for your future give-aways especially the threads yum! yum! delicious. Fun to hear you like folk and classical, too. And audiobooks. Just had to mention “A Girl Named Zippy” as one of my favorite audiobooks. Humorous, and not too taxing a story to follow as you’re doing something else; really a collection of vignettes of the author’s unusual childhood. Also, the sequel, “She Got Up Off the Couch.” Recently you covered lighting and background music/entertainment. What else will you explore for the perfect embroiderer’s environment? But, shaking myself from that self-absorbed and disappointed reverie, I’m right there with you, Mary, with the quiet location, books and subject matter, although I will admit to a passion for history! Merry Christmas, Mary, and thank you for the gifts you bring to us, without fail, all year long. You are a Peach! It is fun. Well, it’s more fun to watch you tear out stitches than for me to tear out my own. Sometimes, it is easier to cut across the top, or bottom, of the stitching, then just pull out the stubs. Leaves less color on the fabric, and you can’t use that “pulled out” thread if it is more than just a few stitches. Mary, I wonder if you’d enjoy the Diana Garabaldon Outlander series? It’s about a nurse from the 1940’s who steps through some standing stones in Scotland and goes back in time to just before the Battle of the Clans/Prince Charlie/the Jacobites I really enjoy all the cultural history. 17thC life in the Scottish highlands, castle and villages. Also, it’s slow enough that you can get distracted by a bit ‘o embroidery tangle or whatever, and still happily keep in train with the story. They are Big Fat Books (something like 30 hours each on audio), so keep one going for ages. http://www.dianagabaldon.com/writing/the-outlander/. I normally read crime but when embroidering, I’m likely to miss whodunit coz I get distracted by what my hands are doing….. Thanks, Megan! I will look them up! They sound fun! Congrats to our winners. The number of those of us who follow your blog keep increasing and inversely proportionate to our chances of winning. But I’m NOT complaining. Its so lovely to see embroidery enthusiasts from all over the world. More power to all you, my dears. Love from India. I’m with you on quiet for concentration and audio books when I’m in the flow. I’ve recently listened to “Martin Chuzzlewit” which was brilliant. Dicken’s sarcasm and wit had me gasping/laughing out loud at times. And as for Mrs Gamp – she is a brilliant creation. I’m fussy about the reader though because they can make or break your enjoyment. and congratulations you lucky winners, you. Mary, Bony is my hero. Is probably only 3 or 4 of the 29 Arthur Upfield wrote that I’ve never read and that I don’t own. Zane Grey is another favourite (cut my teenage reading teeth on those) as well as Peter B Kyne and Gene Stratton Porter of the Limberlost stories, among others. Oh, also any Thelwell comic/cartoon books. I’ve never grown out of my girlhood books either, and still love to read them now incl Ethel Turner, Mary Grant Bruce and L M Montgomery. I love watching the classics and Agatha Christie but not so keen on reading them. I was introduced to audio books by my art teacher. I couldn’t stay at the easel, although I loved to paint. She said we don’t give our brains enough credit for what they’re…can’t explain it but meaning our brains can get bored even though we have to think about what we’re doing and are enjoying it too. An audio book gives the brain that extra to do so it doesn’t get bored. Make sense? Whatever, it worked for me. Strange though, it was the books I’d not normally enjoy that I found the best. I like music for stitching though. Country and Western, the older ones, or if todays, the ‘real’ country like Slim Dusty. I like relaxation music too so, as with my reading, is rather eclectic. Not classical music, although I do appreciate it. The crescendos startle me and the quiet passages make me nervous. In the back of my mind I’m waiting for the volume to increase and ‘get’ me! Well, the forthcoming giveaways sound great, thank you. Will be able to keep a closer eye on your posts again now. Congrats to the winners – have a great time stiching your kits. Folk music works sometimes, but I often get lost contemplating linguistic patterns. I can’t stand pop music. So, I just prefer to embroider while singing, and think. If there must be music, I pick Mozart, because his compositional style is simple – I don’t try to analyze it. Musical analysis is a wonderful terrible habit. I add to my own bag of compositional tricks, but I cannot ever experience classical music peacefully and nonchalantly. I laugh at playlists marketed as “study music” : instead of studying class material, my brain studies the music. The same happens when I’m trying to embroider. Singing is an excellent solution, because I already know everything I need to about the music.